ADDIS ABABA- Fifty Rwandan technicians have graduated from the Ethiopian Airforce Aviation Academy after training for two years, state media said. The Ethiopian Television said the Rwandans graduated with diplomas from Bishoftu Airforce base, southeast of Addis Ababa, on Sunday. The television quoted the Ethiopian Airforce commander, Brig Gen Yilma Medassa, saying the academy had been building its capacity over the years to train both locals and foreigners. “This academy has been continuously working hard to train qualified, committed and disciplined military pilots and technicians by building its capacity. We are also working to modernise our airforce and are delighted to train you. “I hope that when you go back home, you will be our ambassadors by promoting the goodwill of our Academy and Ethiopia in Rwanda,” he said. Rwanda’s Airforce Commander, Maj Gen Charles Karamba, indicated that he had witnessed first-hand the growing capacity of the Ethiopian Airforce Academy and expressed his gratitude to the Addis Ababa government and the institution. “You came here to acquire knowledge and skills; we believe that this has been achieved. 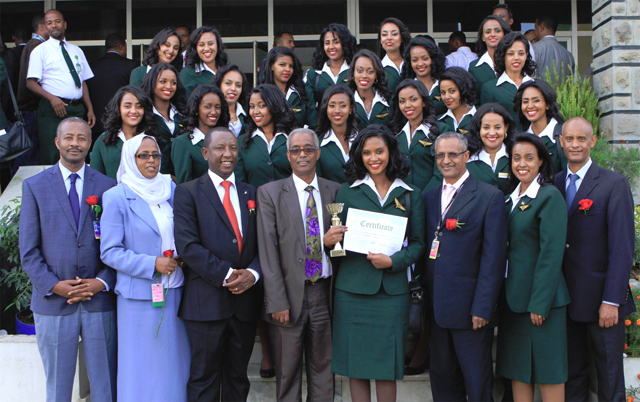 We are happy that you have got the necessary knowledge and skills from your Ethiopian brothers and sisters. And this will strengthen the cooperation between Rwanda and Ethiopia,” he said. The Ethiopia Airforce Aviation Academy was currently training over 500 local and foreign professionals at different levels. In a related development, Ethiopia has unveiled a new republican guard to protect government officials and their families. The members of the unit underwent six-month training both in the country and abroad, after the Council of Ministers approved its establishment. The new republican guards on Sunday demonstrated their skills in the presence of Prime Minister Abiy Ahmed, who is the Commander in Chief of the Ethiopian military. “The purpose of the show is to inform the people of Ethiopia that their leaders are well protected and they do not need to worry about their safety,” said Brig Gen Birhanu Bekele, who is in charge of the Republican Guard. It will be recalled that last June, the reformist Prime Minister escaped an assassination attempt in Addis Ababa during a rally.